SYDNEY—Australian Foreign Minister Julie Bishop said she will raise human rights concerns with Burmese and Cambodian leaders during a three-day summit of the Association of Southeast Asian Nations (ASEAN) that begins in Sydney on Friday. Australia is hosting the special meeting, despite not being a member of the 10-nation bloc, as it seeks to tighten political and trade ties in the region amid the rising influence of the Chinese Communist state. Bishop said that Australia would “very seriously” consider any formal invitation to join the grouping, a move advocated by Indonesian President Joko Widodo. Asked whether the meeting was a direct counter to the Chinese regime’s influence in the region, Bishop said Australia believed the bloc brought it “peace, stability and security”. China claims most of the South China Sea, an important trade route and which is believed to contain large quantities of oil and natural gas, and has been building artificial islands on reefs, some with ports and air strips. Brunei, Malaysia, Vietnam, the Philippines, all of which are members of ASEAN, and Taiwan also have claims in the sea. The inclusion of Burmese leader Aung San Suu Kyi and Cambodia Prime Minister Hun Sen in the meeting has drawn criticism, and large protests are planned. Australian Prime Minister Malcolm Turnbull is under pressure to publicly condemn the deaths and expulsion of thousands of Rohingya Muslims from Burma’s Rakhine State. Burma is also known known as Myanmar. 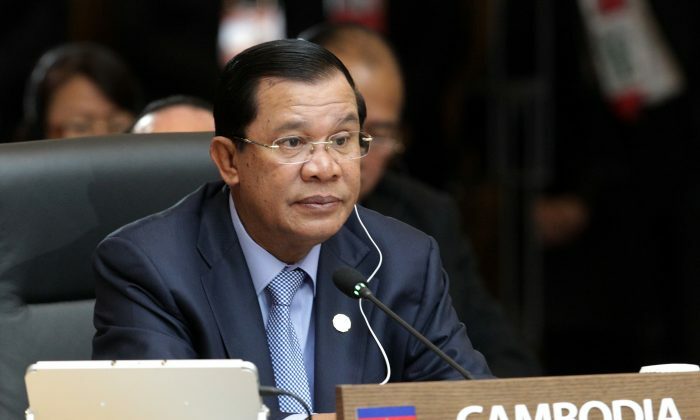 Hun Sen has come under criticism from Western countries and rights groups for a crackdown on government opposition ahead of Cambodia’s elections in July, at which he is expected to extend his 33-year rule. Officially, the summit will focus on fostering closer economic ties among the 10 members of ASEAN and Australia, and countering the threat of Islamic insurgents returning to the region from the Middle East.